Baltimore, MD. 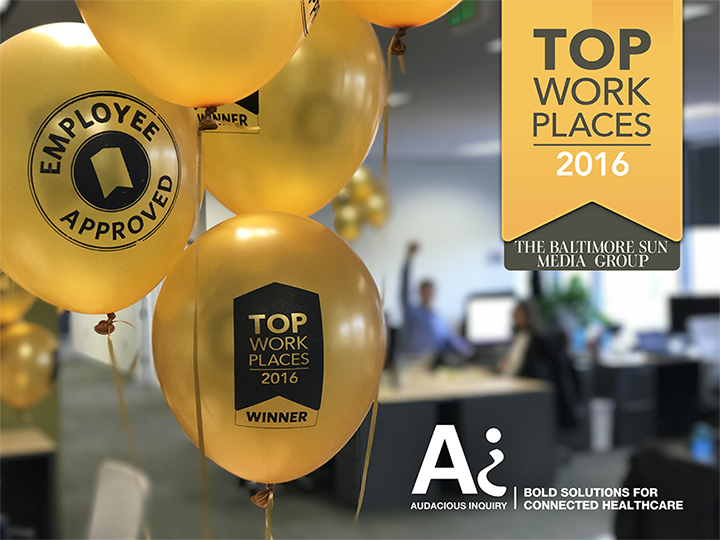 December 5, 2016 – Audacious Inquiry (Ai) has been awarded a 2016 Top Workplaces honor by The Baltimore Sun. The Top Workplaces lists are based solely on the results of an employee feedback survey administered by WorkplaceDynamics, LLC, a leading research firm that specializes in organizational health and workplace improvement. Several aspects of workplace culture were measured, including Alignment, Execution, and Connection, just to name a few. In 2016, Ai hired 17 people, which comes out to 25% growth for the year, as of December 1. For the past six years, the company has been recognized on the INC 5000 list, a compilation by Inc. Magazine of the fastest growing private companies in the United States. 2017 is looking bright, as Ai continues to expand their reach by adding more people to their team to support product development and provide customer support.